PENSACOLA, Fla., June 28, 2018―Families are invited to help “Hit a Home Run for Early Learning” at the WSRE Imagination Station at Blue Wahoos Stadium on Sunday, Aug. 5, starting at 4 p.m. There will be fun children’s activities and appearances by Clifford the Big Red Dog, and each child will receive a free book, while supplies last. The Imagination Station is located outside the stadium near the box office. 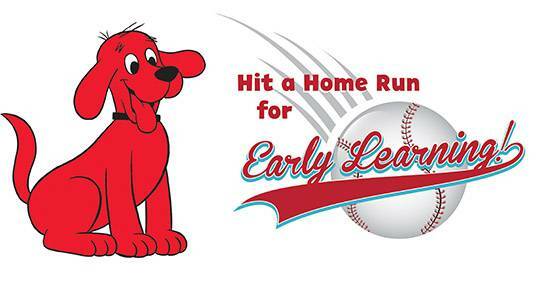 Clifford will also be inside the stadium in time for a pre-game “Fun Run for Reading” around the bases and to throw a ceremonial first pitch when the Pensacola Blue Wahoos play the Montgomery Biscuits. “That will be ‘Bark in the Park’ night when Wahoos fans can bring dogs to the game, so we’re bringing every kid’s favorite, larger-than-life, four-legged friend, Clifford,” said Jill Hubbs, director of WSRE Educational Content & Services, who will share early childhood education resources with parents during the event. The WSRE Imagination Station is a free early learning activity center for parents to engage with their children in hands-on activities using PBS KIDS educational resources, including computer games, books and toys. Regular hours are 9 a.m. to noon Monday through Saturday and during Pensacola Blue Wahoos home games, opening an hour before the first pitch. “Clifford the Big Red Dog” is an animated television series produced by Scholastic Entertainment, who recently announced a fall 2019 relaunch of the multiple Emmy-winning preschool series based on the best-selling books by Norman Bridwell.